Varanasi, the name rings a plethora of nostalgia and memories of my youth, which I spent as a student of Banaras Hindu University. There couldn’t have been a better place for me than Varanasi during my Formative years as a student of photography. Varanasi gave me the insight, perspective, and a future to follow my passion of Photography by an intuitive twist of fate. 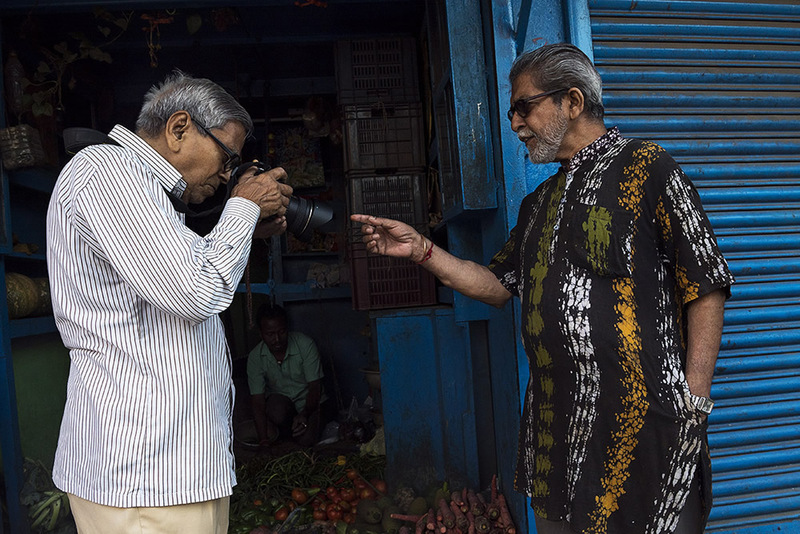 The twist of fate remains an inexplicable mystery to myself till this day, as I chose to study photography in Banaras despite the stiff opposition from my family. I do not know, what drove me towards this city despite never having visited the city ever, but the desire was so strong that I chose to be rather disowned by the family for defying their choice and deciding to pursue my studies in Banaras. Kasi, Banaras or Varanasi is the name of the same city, which has got changed over the annals of antiquity from ancient Vedic texts to Mughal to the Colonial rule. Strangely, it never lost its true fervor with the changing times, and has retained its antique charm alongside the compulsions of Modernity by some mysterious reasons. The tools may have changed but the means remain the same. It is a mystery city, which remains juxtaposed in it more than 4000 years of ancient existence and current modernity. It has shown the will to accommodate the constants of change and yet retained its ancient culture to reemerge into a famous Hindu Pilgrimage Centre. It has inspired many & shall continue to do so to many time travelers like me. My inspiration to photograph the Brick kiln workers has somewhat been inspired by the fact that when I learnt that the remnants of present Varanasi were unearthed in the area known as Rajghat, pottery, and artifacts dating back to 800 BC, suggesting evidence of ancient settlements in the area. The city offers something to everyone, otherwise, why would filmmakers like Richard Gardener choose to film their movies in Banaras. To me, the city has given a “perspective”, and to use photography as a means to document the world around, identify with the yet to be explored the character of the city. 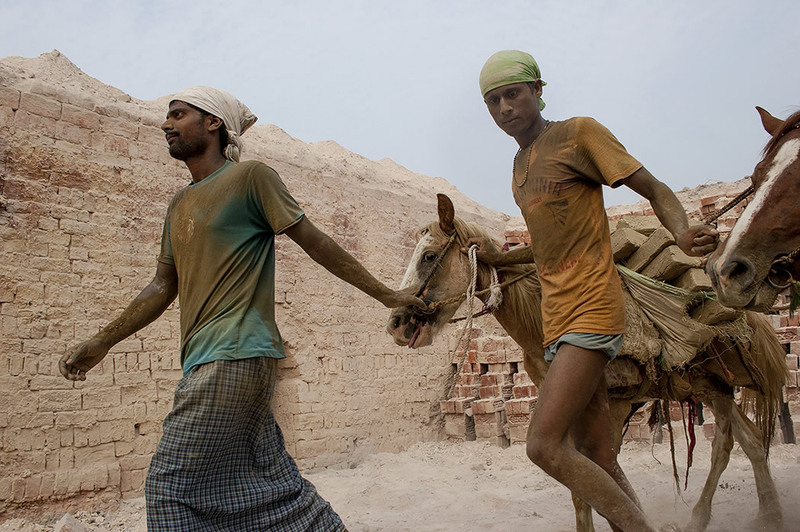 I have tried to capture the frailty of my imagination over the stark reality of the brick kiln worker’s world. I try to interpret the faces of my subjects with the façade that they put to brave the odds against them. They are usually the ignored, overlooked, underprivileged creations of the same creator, who has perhaps just chosen them to reinvigorate our belief in the power of human resilience, patience, and faith by the sheer difficulties thrown by life at them and their power to overcome these difficulties with élan& dignity. I choose to make a statement to sensitize my audiences about the great privileges that they have in comparison to a larger section of the society and silent appeal at a subconscious level to arouse their feelings called “ Sharing”. I feel privileged if my photographs manage to stir positive emotions towards these marginalized sections of society. I try to say, their hidden stories, struggles, and efforts to live with an only available elixir of life called “ faith”. 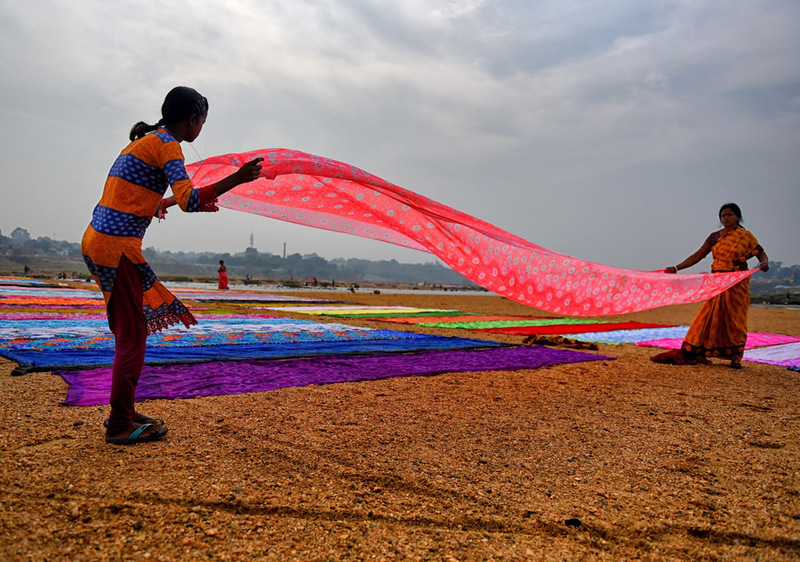 I chose brick kiln as a subject due to my earthy connection with soil and cultural background, which equates the land as mother and soil as the nurturer of life. 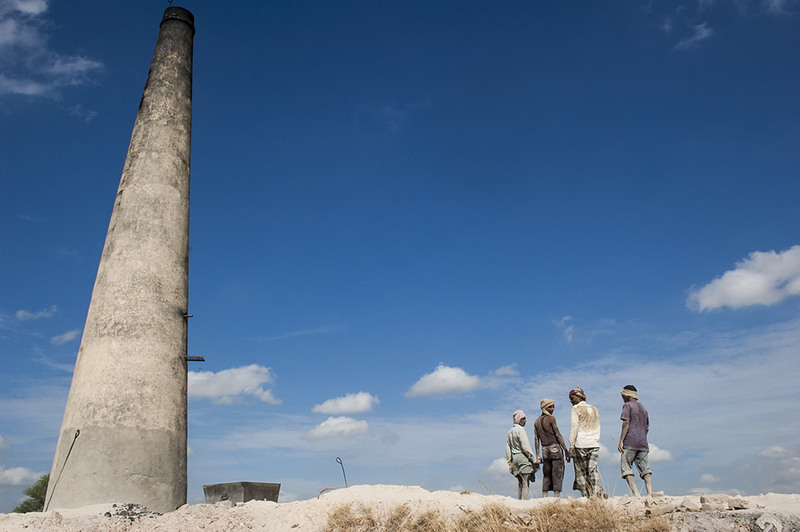 Brick kilns being the general view of Indian rural landscape, had always been a part of my curious nature. I wanted to understand what tall chimneys, a primitive process of digging and carrying soil by little children on their heads meant? I wanted to know what was the final journey of this soil which robbed small children of their childhood, delicate women of their femininity, animals of their sturdiness, before building a HOME for somebody. 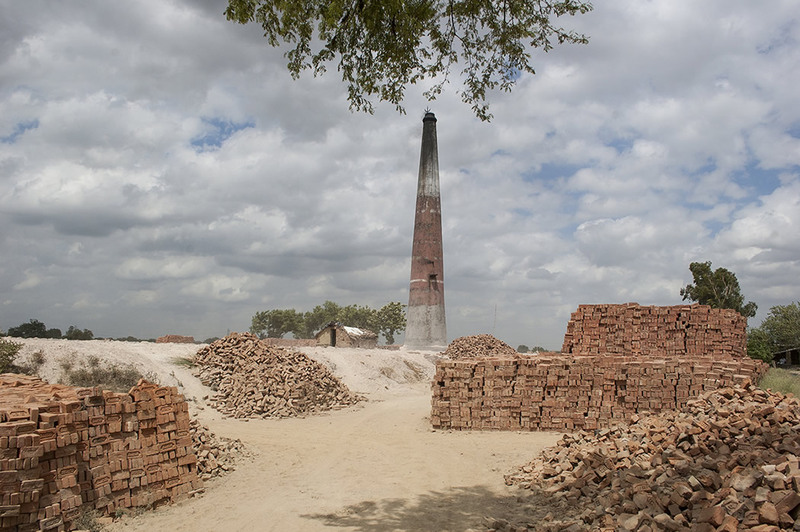 It was a heartbreaking revelation to know that most of the brick kiln workers died at an early age due to lung-related illnesses as an occupational hazard. I found that it was a journey undertaken by the soil to become a brick, to build a home, consecrated by the people who were ironically HOMELESS, themselves. It was a journey of human helplessness, which brought migrant villagers in search of a better future and getting enslaved by the very destiny they wanted to change. 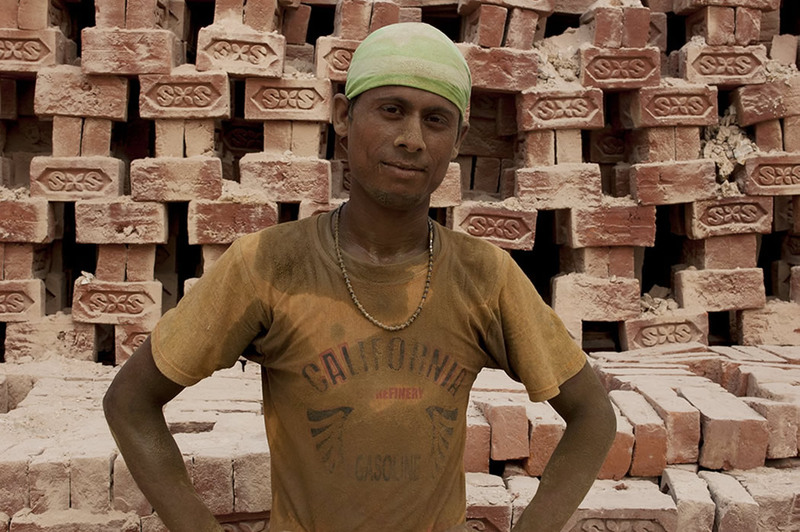 A worker takes a break during the hottest moments of the day at Varanasi brick kiln. These men do not have any opportunity to work in a safe environment. People start working in the morning and continue till the end of the day. 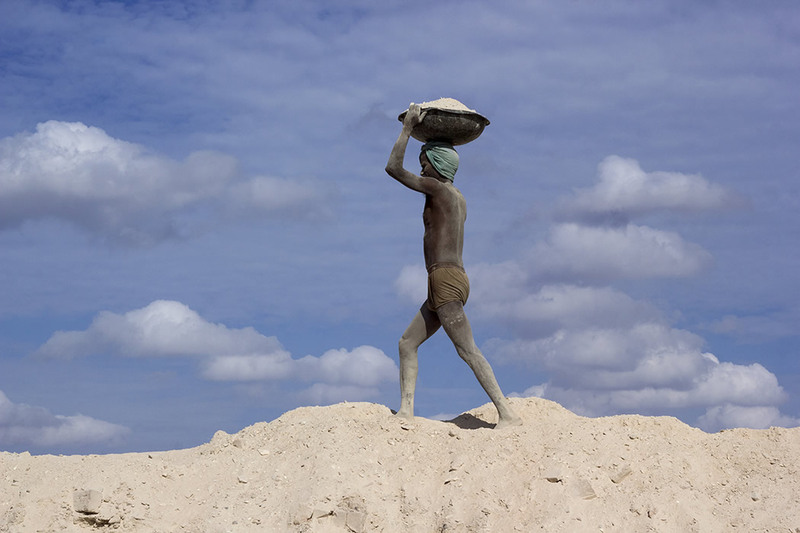 A young worker carrying cleaned soil after the process of weathering. Due to the softness of the soil, workers feel more comfortable with fewer clothes, though they suffer massive dust allergy sometimes. 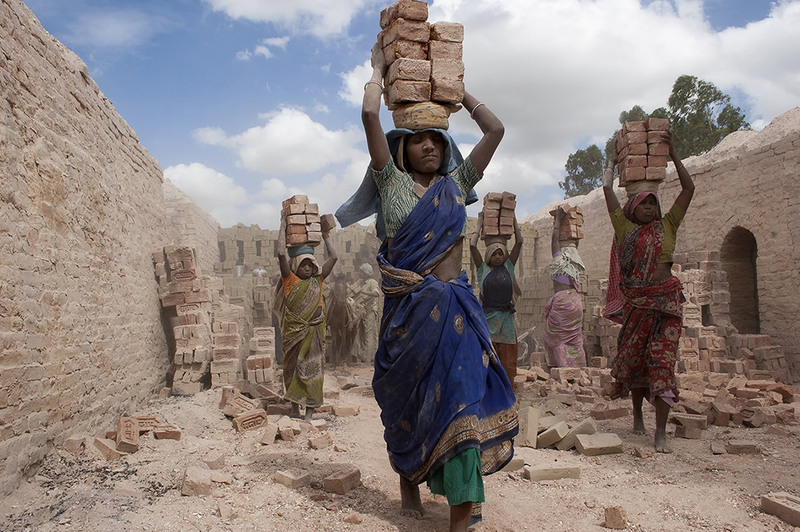 Women carrying burnt bricks in barefoot inside the factory area, and is a common cause of dry skin diseases, but they have no option but to earn a little money for livelihood. Harmful particles in the dust are one of the major causes of respiratory diseases, as the woman in the image faces several body infections in the later stage in the life. 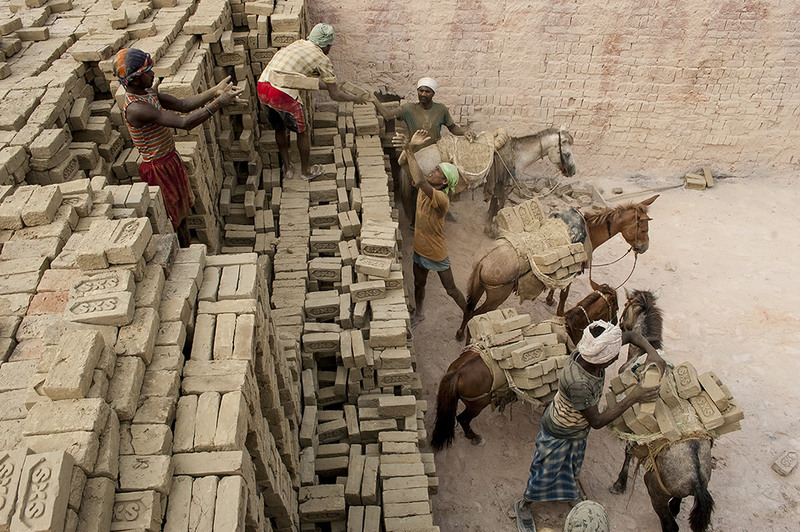 Workers are carrying brunt bricks on the back of a horse. 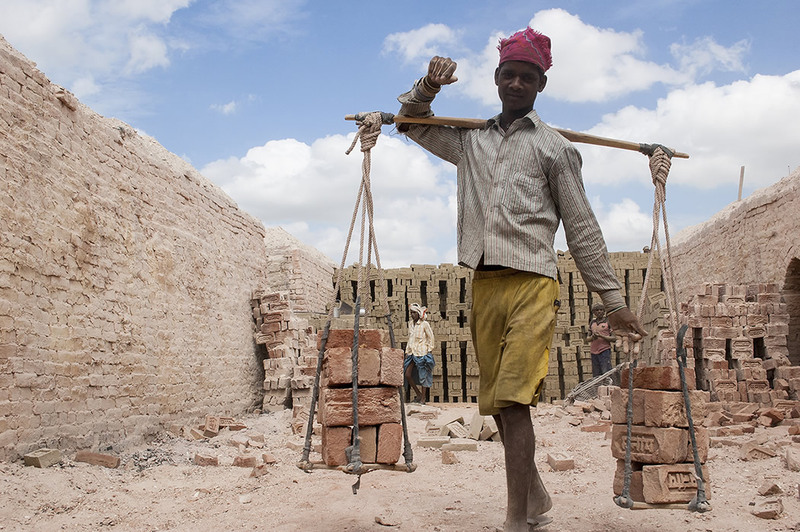 In India, bricks are made by hand with a plastic or metal mould. 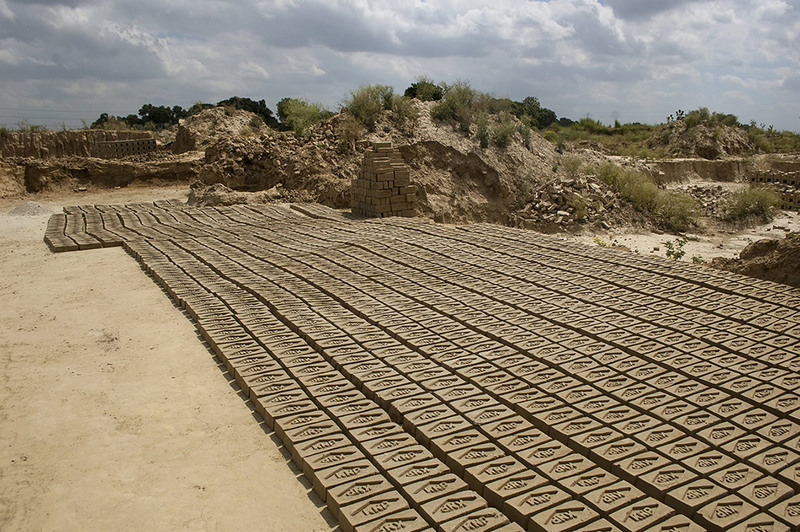 After molding those soft solid bricks kept on the open ground exposed at the direct sunlight for a few days for optimum drying. 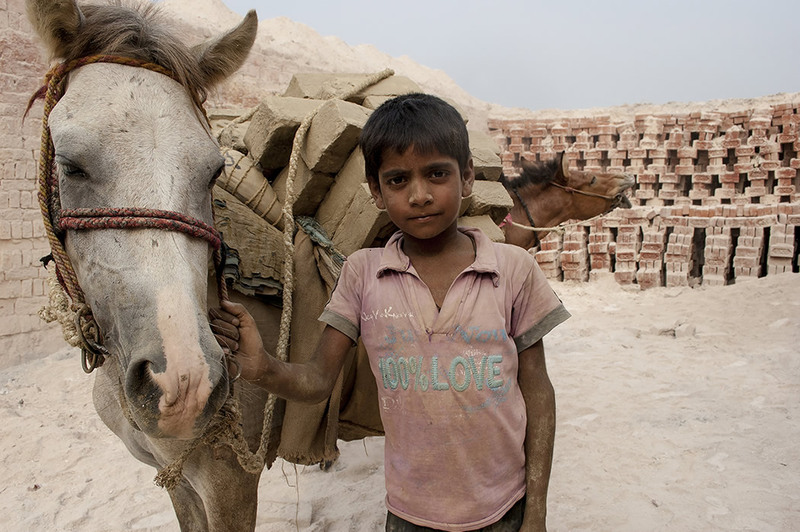 A child worker carries raw bricks on the back of a horse. Families work along. 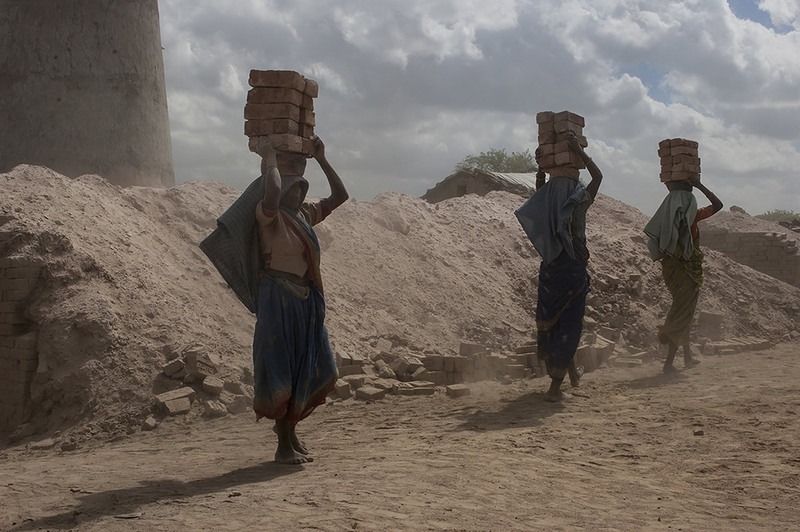 A team of brick workers carries dried brick from the storage to the burning room. 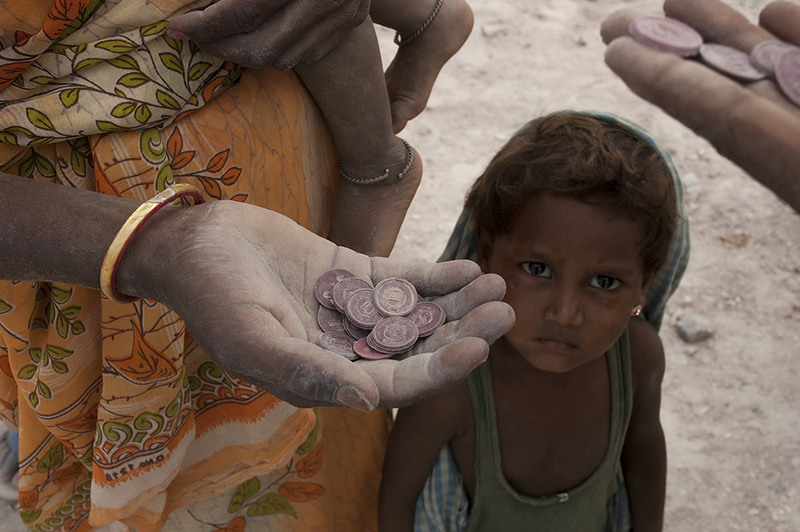 A woman along with her children, counting tokens by which she will get paid at the day’s end. 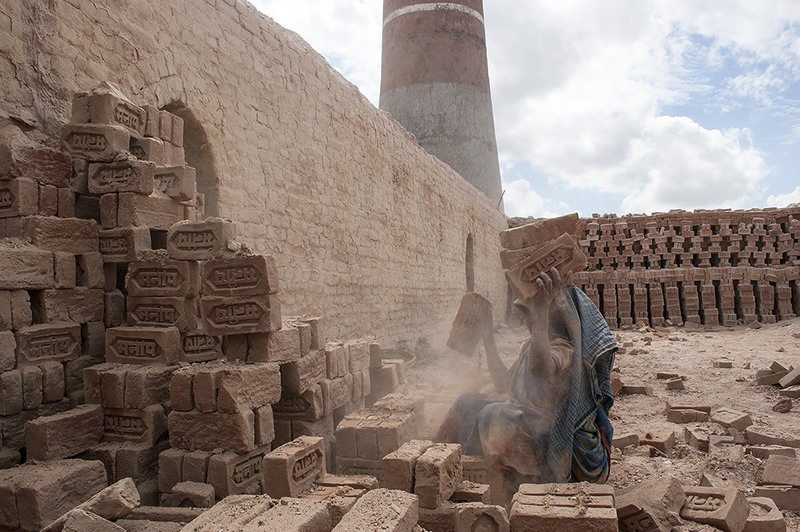 Most of the workers are daily wages basis in such brick kilns. A little girl working in the kiln factory on a sunny afternoon. Like other children, she keeps working along with her poor parents. Even formal education is a big dream in their lives. 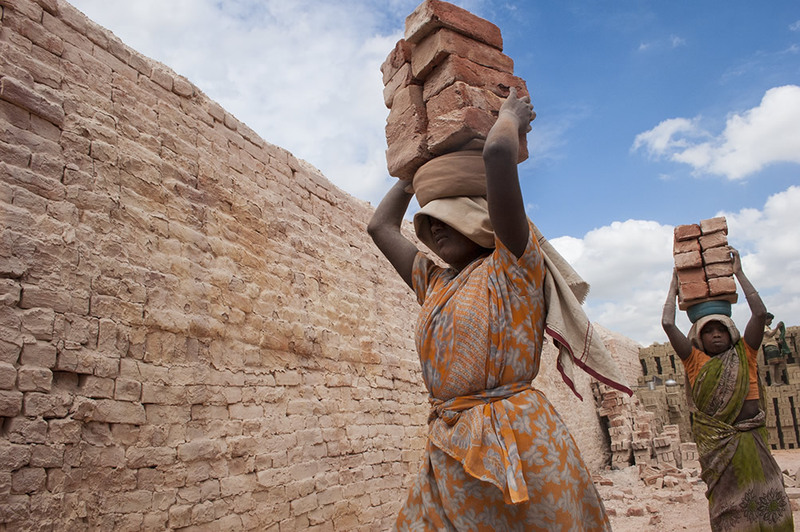 A worker carrying dried bricks on her shoulders, another option to shift materials on a more quick and quantitative way. 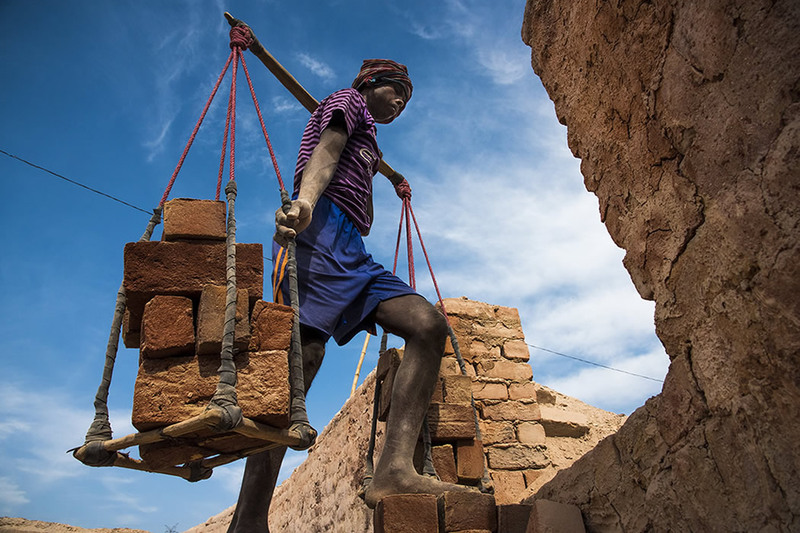 A worker carrying dried bricks on his shoulders. 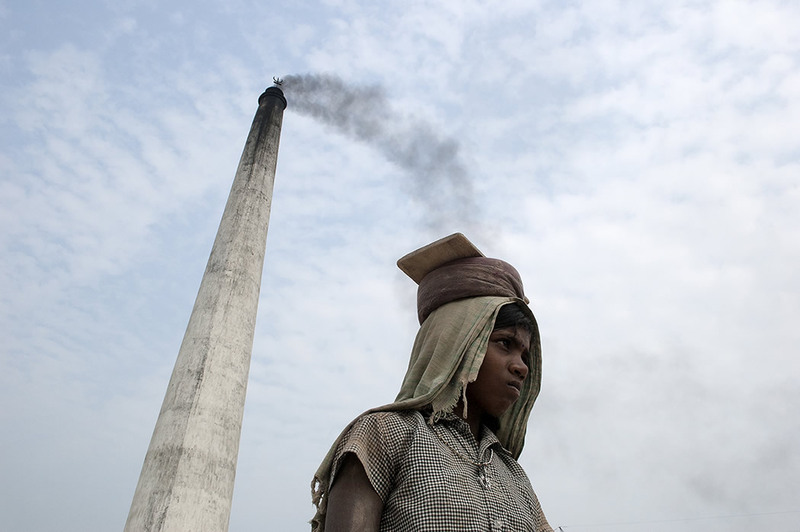 Amidst the acrid coal soot, workers stay the entire session in the brick processing unit all day long. Women work the same as the men. They carry raw materials on their heads all day. 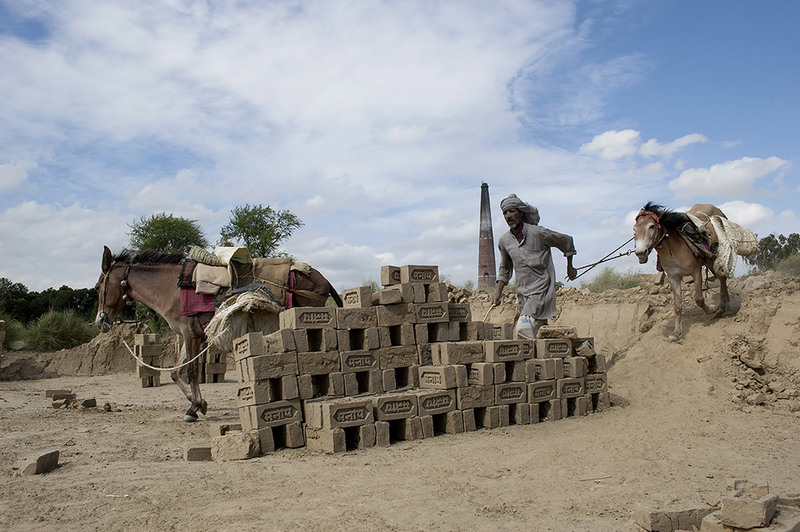 An elder man whips his horses within the brick premises. A worker with cloths warped around his head, shows a dusty face. 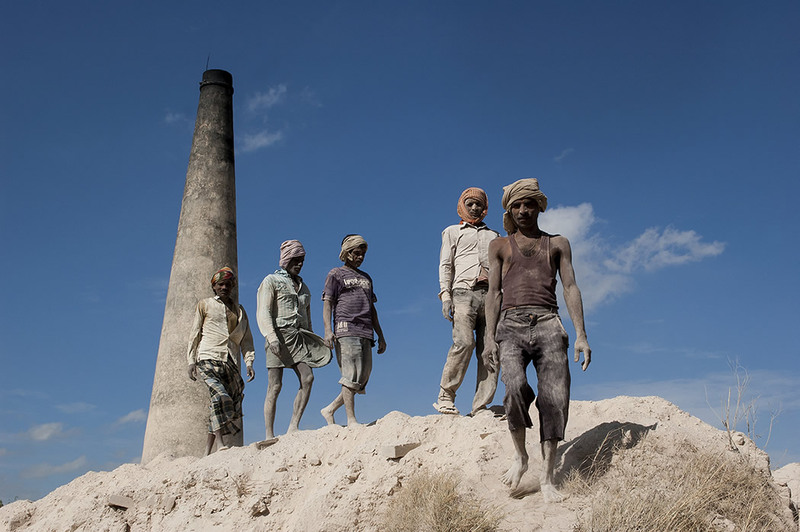 A group of four workers walking in the raw soils inside the kiln factory. 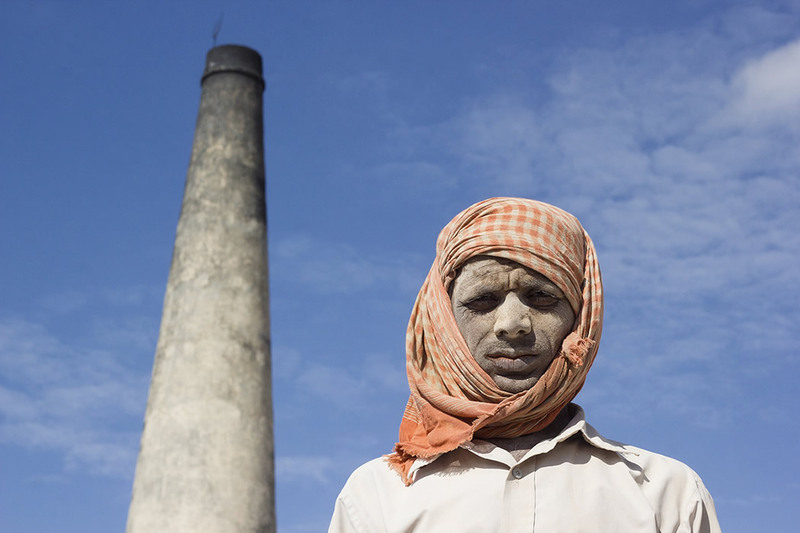 A worker of the kiln poses for the camera. Another teenage girl, returning from the burning spot, bringing the bricks. She moves bricks manually throughout all day. 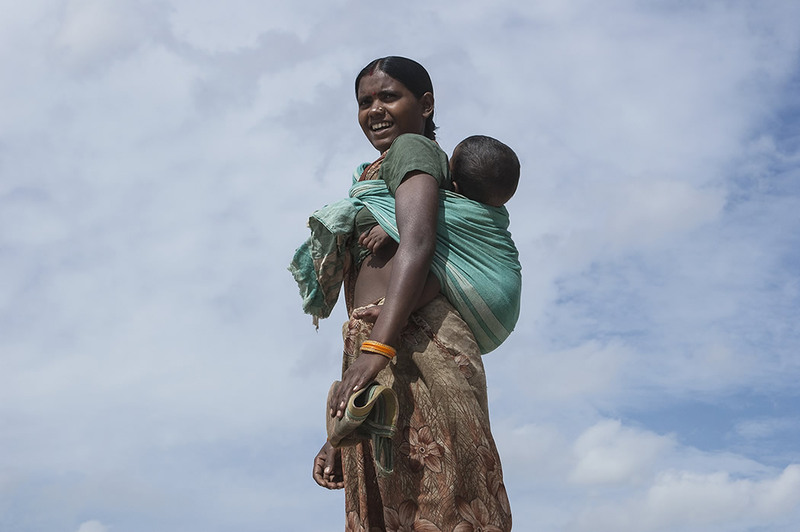 A woman working in the brick factory carrying her very young baby on her back. 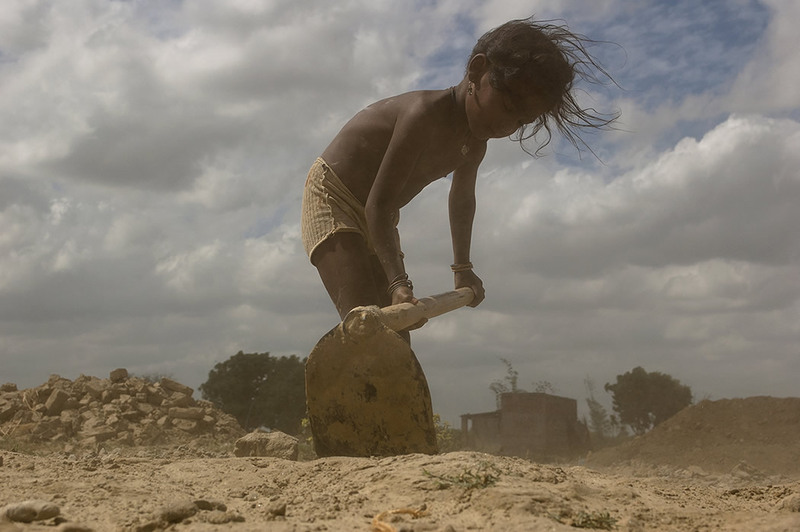 As most of the families work together in this factory, they have no option to keep their children at home, and most of the times dust makes harm to the young babies. Its happen When workers back to their villages. 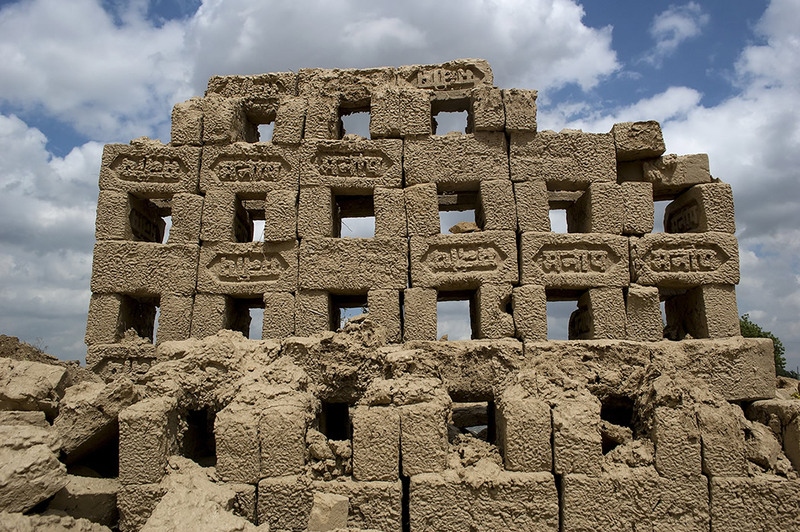 Drying of bricks usually done by placing those mud blocks in open and sunny places in India to ensure free circulation of air and heat. The bricks are allowed to dry until they are left with some moisture content. 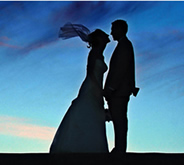 The drying period usually depends on the weather condition and lasts up to 20 days. 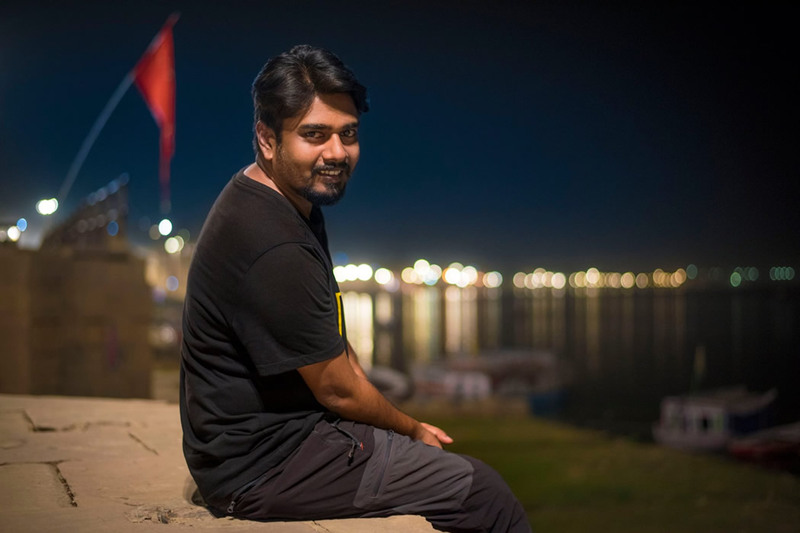 Rajesh Kumar Singh, one of the finest image makers, known for his evocative black and white photograph, captures the cultures, beauty of human disability and time. Born in Bokaro Steel City, Jharkhand this young talent attained his education from Banaras Hindu University. His initial works focus on the raw conduct of people living in Varanasi, one of the ancient living cities in the world. 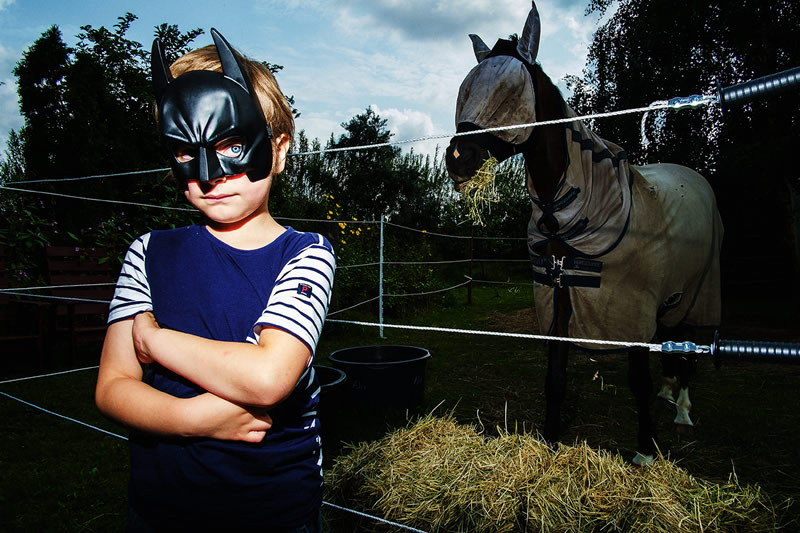 He uses photography as a means to project the world a center of visual meditation. Singh name is registered in Limca book of record for his Image “The Kill”. 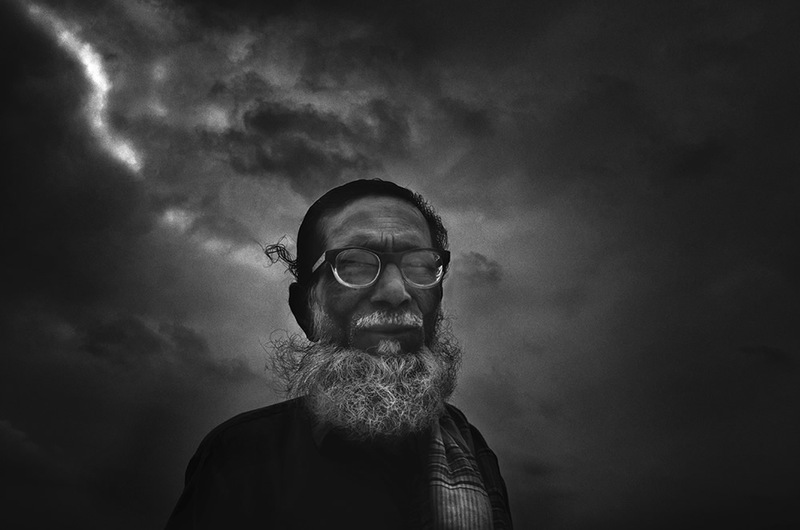 Rajesh’s works have been featured in the major Photography Magazine- BETTER PHOTOGRAPHY. , Leaders Speak Magazine. Servel wonderful works have been featured in numerous exhibitions, some of which are 56th National Exhibition of Art, Govt. of India, and Ministry of Culture. 8th Biennale of Photography (Poland), Human Rights Art exhibition, Canada and South Taxes University, United States.CRAF (Centro di Ricerca e ArchivazonedellaFotografia), Spilimbergo, Italy, Korean Passion Meets India, Korea- India Contemporary Art Exchange Exhibition, Korean Culture Center, India. 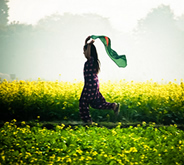 All the pictures in this post are copyrighted Rajesh Kumar Singh. Their reproduction, even in part, is forbidden without the explicit approval of the rightful owners.